Ben's 6th birthday is on Monday, so we took a little weekend road trip to celebrate. Since my goal was driving straight there, other than bathroom breaks, we packed a lunch to bring along in the car. I figured, we'll end up eating out most meals for a few days, may as well at least eat a breakfast and lunch of my choosing! 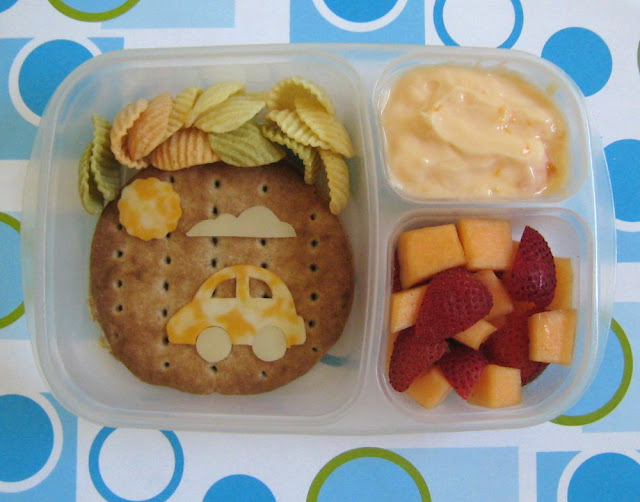 Ben has a cream cheese and jelly sandwich, with a little road trip scene on top made of cheese (car, sun, cloud). The car and sun are cut from cookie cutters, but I tried my hand at the cloud on my own, it's not too bad! To go with that, he has veggie chips, peach yogurt, and strawberries & cantaloupe for fruit choices. Road trip meals have to be mostly non-messy, as I break my "no food in my car" rule for them, so minimal crumby choices. I have a relatively new car and no one is allowed to eat in it, but since it's 8 hours, I had to be a wee bit flexible. I'll be vacuuming it out on Tuesday for sure. We're packed, of course, in our EasyLunchboxes. For a road trip, I like the one piece function, lots of storage and the fact that they fit nicely in the kids' laps. And they stack nicely in the cooler that fits perfectly in my front seat, so that's an added bonus. Cute trip bento! I love the little cloud :D Happy Birthday to Mr.Ben!! The ELBs are also SUPER EASY to pass back to little hands, and they can open them themselves, and you don't have to hunt around later for all the little lids and section dividers later, like with multi-tier bento boxes and Laptop Lunches.